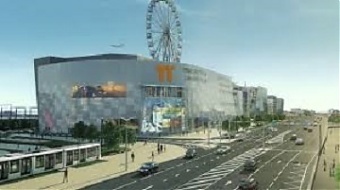 The brand new T1 Mall of Tallinn shopping and entertainment center that will partially open in Tallinn Friday cost approximately 80 mln euros to build, around 10% more than planned, the developer says LETA/BNS. "This mall will turn out more expensive than we counted in 2015. Probably we will end up at 80 mln euros, while in 2015 we set it down at 72 mln euros," told Allan Remmelkoor, board member of the mall's developer Pro Kapital Grupp. Remmelkoor said that he is satisfied with the outcome regardless. "We all know what has happened on the construction market in the past three years and we, too, have significantly improved and modified this project during the three years. This is also why we couldn't stick to the October opening date announced earlier and it was adjourned to November," he said. "But I consider the price good. If we were to start developing a thing like this now, the sum total would be much, much bigger." On Friday, the retail area of the new center will open on the three lower floors of the large structure. Construction work continues in the entertainment portion situated on the fourth level, with Remmelkoor expecting the entertainment area to open still within this year. A large ferris wheel on the roof of the building will open in February, he added. "While on the one hand we're sad of course that we are not 100 % ready, we've got plenty of very exciting news in store for the next few weeks and couple of months," Remmelkoor said, adding that having the center open by the start of the Christmas season is what really matters. In terms of visitor numbers, T1 hopes to be a competitor to neighboring Ulemiste Center. "If we manege to keep the number of visitors in the first year at six mln -- 17,000 to 18,000 people a day -- this would be a very good start for us. Ulemiste gets 20,000 visits a day," he said. T1 has a significant number of stores of Italian origin and several Italians have worked on the building's architectural design. "We have had a lot of contacts with Italy through the decades indeed. I have studied shopping center management in Italy and we have ample contacts in the retail circles of Italy. We are opening 60 places that run a completely new concept, which certainly pleases us. Italy definitely is represented the most among foreign stores," Remmelkoor added. He said that even though T1 is situated just across the railway from Ulemiste Center, a traditional suburban shopping mall, they also have solid elements of a downtown mall. "We are a symbiosis of both. The Ulemiste area is the fastest developing area of Tallinn and we also are absolutely on the fringes of the city center. The tram link is ready and I believe that we are becoming ever more a part of the city center," he said. "Second, we are the gateway to Tallinn and Estonia. Here's where the airport is, where the public transport hub will be, and the Rail Baltic passenger terminal will be located here," Remmelkoor said. The gross floor area of T1 Mall of Tallinn is 130,000 square meters, of which leasable area makes up some 55,000 square meters. In addition to cafes and restaurants, the center features a Selver hypermarket, a multiplex, an entertainment center, and a ferris wheel on the roof. Construction of the center by AS Merko Eesti Ehitus started in 2015.